I like Derren Brown, he is an entertainer who admits that what he does is entirely rational. In this interview he comes across well, but is slightly reluctant to criticize psychics in their entirety. If you haven't yet seen Mr Deity then make sure you start watching! The British Homeopathic Association has today launched Homeopathy Awareness Week. 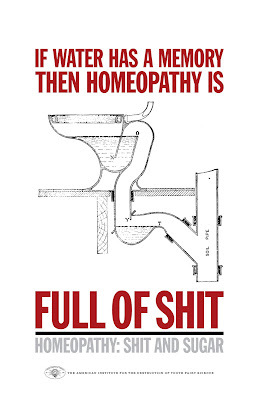 I'd like to make you aware of the all of the evidence that shows homeopathy to be effective: . It was that easy! Incidentally, the BHA's website is www.trusthomeopathy.org. Trust homeopaty to take your money and not cure you? Trust homeopathy practitioners to be liars? Trust homeopathy to give you water when you need medicine? Any more suggestions? I guess this just about sums it up really! In what is probably the first big experiment performed on the micro-blogging service Twitter, psychologist and magician Richard Wiseman has shown that those people calling themselves psychics are no more psychic than the rest of us. Of course this is hardly surprising, but by opening the experimental process to anybody who wants to participate it may become easier to show the deluded and fraudulent for what they really are. 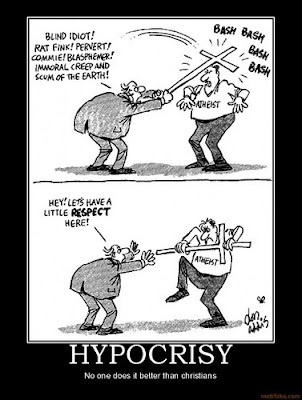 Why do people insist on worshiping something just because it's unusual? (Actually, it's probably not that unusual). I've been using Newsvine for a while now, for two reasons. The first is it acts like a storage facility for stuff from the press that I find interesting and would loose otherwise, the second is it produces an RSS feed of what I find interesting that I use on my site. I haven't, until now, been particularly interested in its other features. An article I posted a while ago about creationism in the UK education system has gathered around 200 comments (that's roughly 200 more than any other article I've posted). This shows that the debate is alive and well. So, shamelessly, here is a link to my Newsvine. You can even vote for my stories!